I love Rice Krispie treats! I'm an even bigger fan of the Little Debbie version. In fact, I will embarassingly admit that I have eaten so many of them in one day that my gums were sore from the crunchiness of the cereal. That's some serious snacking there! It's been years since I've made homemade Rice Krispie treats. But, after seeing so many different variations of them out in the blogging world, I decided it was time for me to get busy in the kitchen and whip up a batch of these Cake Batter Rice Krispie Treats. The second time is the charm... Why, you may ask, would I need to make two batches of Rice Krispie treats before I got them right? Well, I'll tell you. The first time around, I used an entire bottle of sprinkles that melted when I poured them into the warm marshmallow/krispies mixture and turned it into a tie-dyed-looking mess. I've learned two valuable lessons from this mishap: 1. Sprinkles "run" when heat is applied and 2. I don't like the taste of melted sprinkles. Yuck! So, it was back to the kitchen where I made another batch of treats and lightly sprinkled tiny non-pareils on top. Much prettier and tastier! This recipe caught my eye on one of my linky parties where it was posted by Muriel from Cake Bake and Decorate who acknowledged How Sweet It Is as her recipe source. 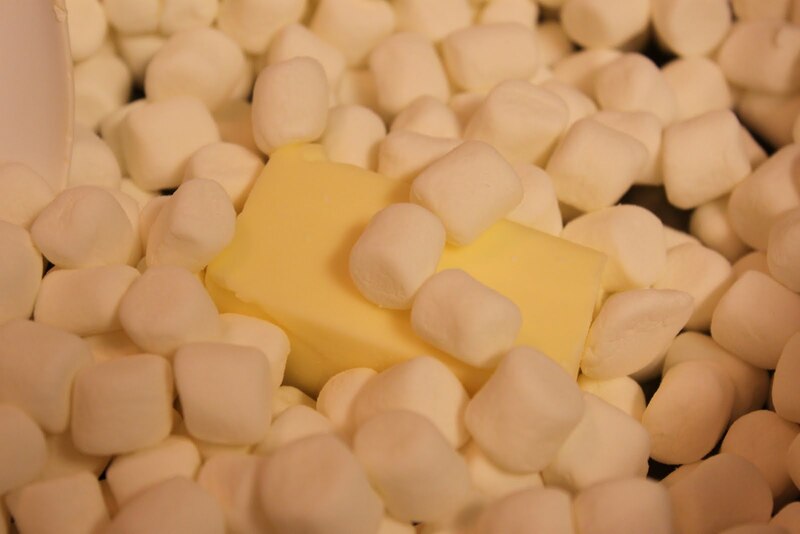 In a large saucepan over medium heat, melt the butter and marshmallows together stirring constantly. While the marshmallows are melting, slowly add in the cake mix until well incorporated. Once everything is melted, stir in the rice krispies and most of the bottle of sprinkles (reserve just a few sprinkles to decorate the top). Store in an airtight container. 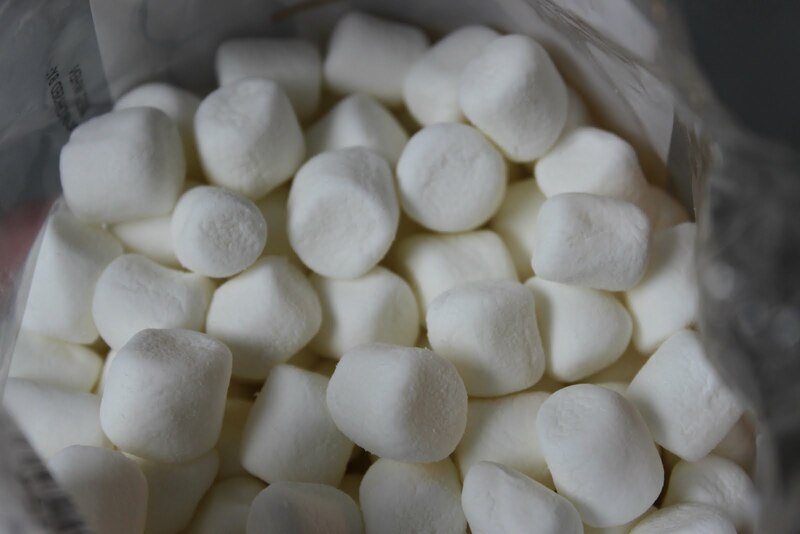 The smell of marshmallows has to go down as one of my favorite scents of all time! 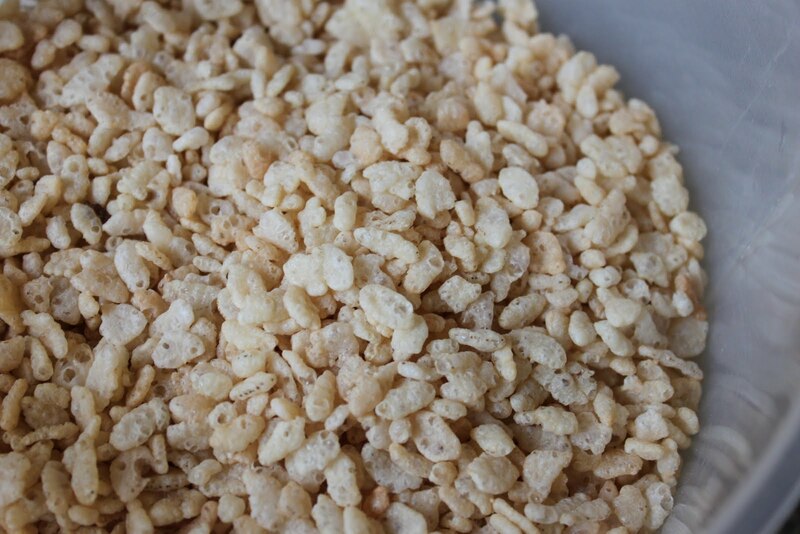 The "hardest" part of making Rice Krispy treats - the melting of the butter and marshmallows. This takes me back to my childhood when my mom would makes these for us. 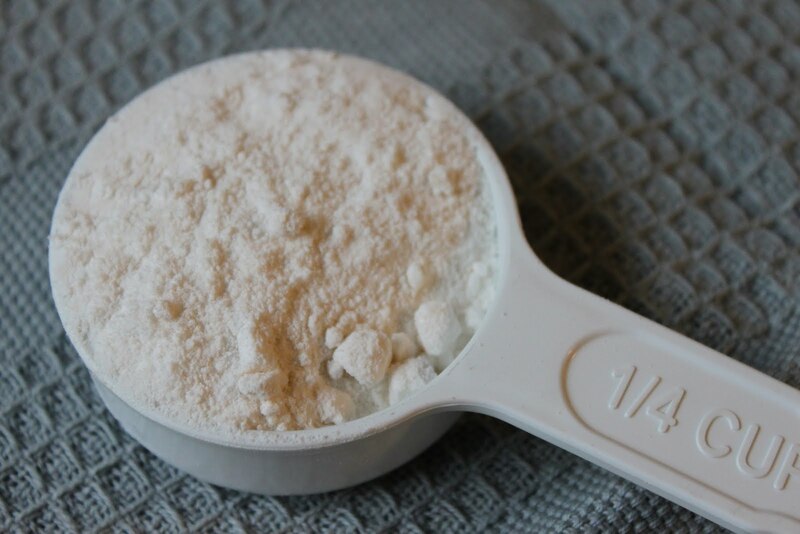 Gradually sprinkle in 1/4 cup of your favorite cake mix. I used golden butter cake mix but I think the possibilities are endless considering there are so many cake mix flavors out there. I am proud to say that I got this cereal at a BOGO sale. This fact makes using them in this recipe that much more fun. I'm going to include my mishap in this post. 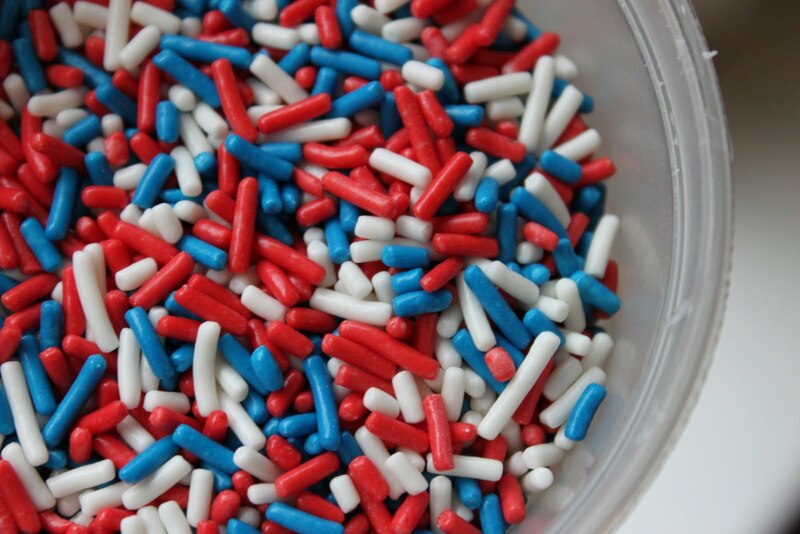 These are the sprinkles I used in the first batch. Pretty and festive. But, as they blended into the warm marshmallow mixture, the colors ran. Not so pretty...not so festive! Second verse, same as the first. Much better results with the light sprinkling of non-pareils on top, not mixed into the treats. It's a little hard to detect the subtle flavor of the cake mix in these treats. I would need a side-by-side comparison between these and regular treats. But, they were still delicious! My gums are aching already! Join my linky party at Sweet Indulgences Sunday! As many now know, I am a Rice Krispie Treat fanatic. Or lunatic. Whatever. Those look crazy good. Thanks for sharing! I haven't had rice krispie treats in such a long time. They're called rice bubbles here but they look and taste the same. What a great idea to use cake mix for a different flavor. Doubling the cake mix is an excellent idea! I'll definitely try that next time. Those look great. And perfect for the 4th too. I LOVE the Cook Book! I have so many recipes already marked to cook. Lark, glad the cookbook made it to you and that you like it. I love it and think it gets better every time I read through it. Take care! How pretty! Glad they worked out better the second time! 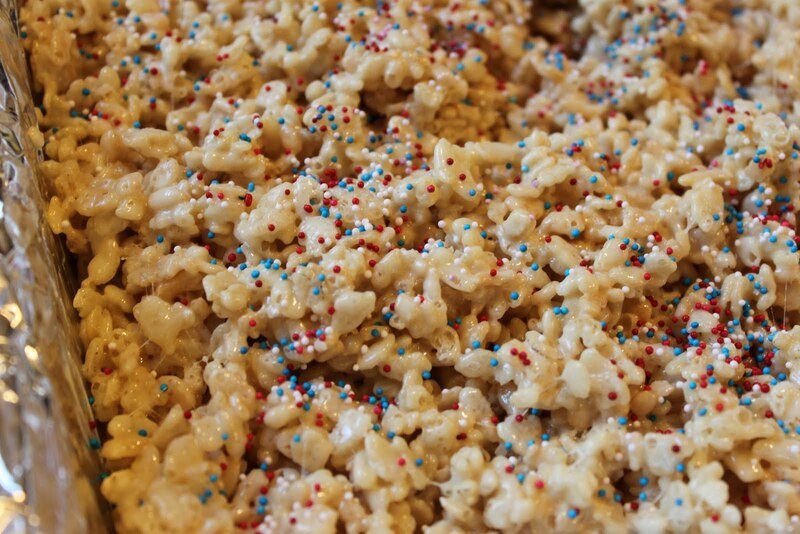 I have never tried rice crispy treats with cake mix, but I sure will next time I make them! What a great idea! Yum, I've never seen cake batter rice krispy treats before. What a deliciously creative idea. Thanks for linking it up to Sweets for a Saturday. Lisa, someone suggested doubling the cake mix to make it even tastier. I'm already brainstorming different flavor combinations. These look awesome! 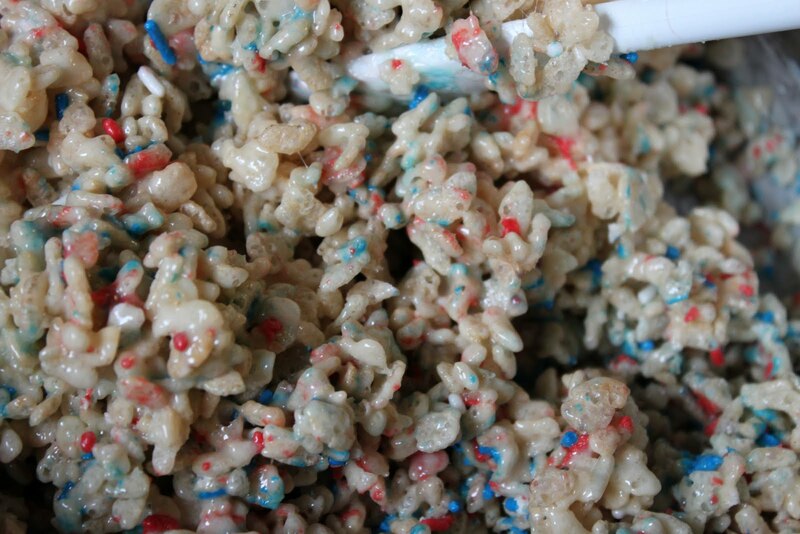 I'm making 4th of july rice krispies for a family thing tomorrow-- maybe I'll try these! Thanks for the idea :) You should swing by and link up!! And I'll be here tomorrow for the party :) --Also, I've got a new featured button, so if you want to switch out the old one you've got, go for it!! It looks so yummy! Lovely patriotic dish. Thanks for sharing. 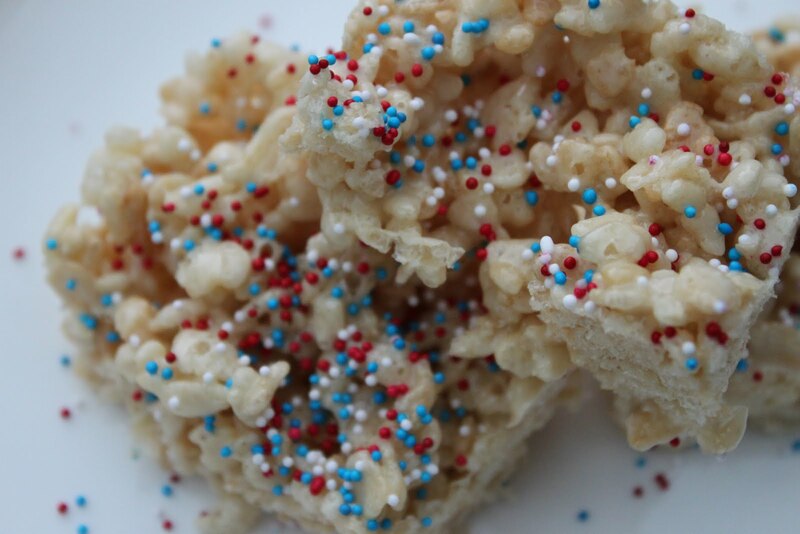 What a fun take on traditional rice krispies! Love the sprinkles. Cake batter makes everything taste better, doesn't it? 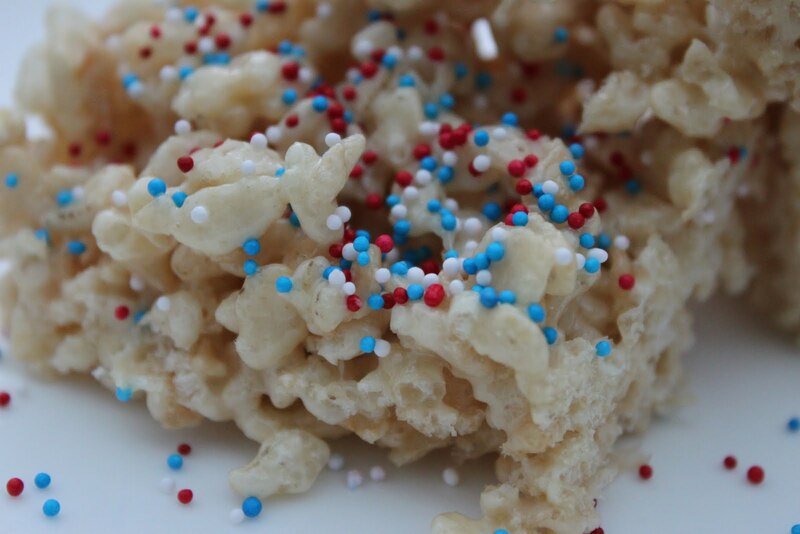 Your amazing Krispy Treats just got into the Top 5 for last week's Sweets for a Saturday. Great job! I SO had to try this!! I just posted about my variation - thanks a bunch for the inspiration!! It's such a fun treat! !